The Andean spectacled bear, a mysterious and endangered species and inspiration for Paddington Bear, was the focus of my years of study in the Andean cloud forest of Bolivia's Madidi National Park. During long periods spent alone for my research, I became obsessed with the intricate patterns and colour around me. 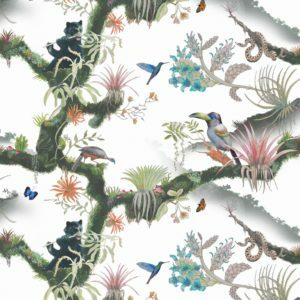 Lichens, thin-lipped frogs, hummingbirds and toucans, along with my bears, were the subjects of my detailed drawings, and have formed the basis of this design. The composition of the design itself was inspired by a Josef Frank design from 1938 called Anakreon. His design was based on a 3,500-year-old fresco, discovered by a friend of Frank's, from the palace in Knossos on Crete. The design repeats once across the 70cm width of the wallpaper, so is a medium scale design. 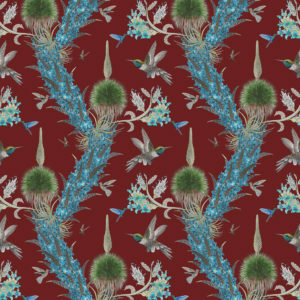 This design is also available in a large scale on a wide width wallpaper. With exquisite botanical detail, this design builds on biophilic passion in interiors for honouring the natural world. 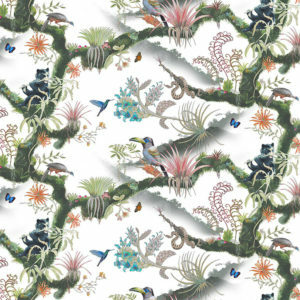 Furthermore, for every roll of wallpaper sold, 100m2 of critical wild Habitat is preserved through World Land Trust. This is an eco-friendly Fine gicleé digitally-printed “real” wallpaper. It is printed in the UK on a natural non-woven cellulose-based substrate made from recycled materials – recycled polyester (PET) fibre and recycled wood pulp. The production process is solvent free with minimal waste and energy inputs. The Madidi Hummingbirds design is a tribute to the incredible diversity of Andean hummingbirds, of which there are 140 different species. This design features Andean Hillstars, Great Sapphirewings, and Giant Hummingbirds. These super-heroic little birds can fly at speeds which, relative to body length, are greater than any other vertebrate, with wing-speeds of over 80 beats per second. They also serve as specific pollinators for many flowers such as those in the Puya genus. The bases of these bromeliads are important bear foods and many have beautiful turquoise flowers. 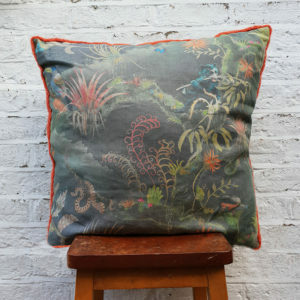 They also have natural antifreeze and some of the longest flower spikes in the world such as Puya raymondi, known as Queen of the Andes, the spherical plant bases and spikes depicted in this design. This plant grows to 15m (50ft) tall with 30,000 individual flowers when it blooms, which is once every one hundred years! The contemporary design has quite an elegant structured style and a limited palate based around the blues and greens of the Puya flowers. With exquisite botanical detail, it builds upon the current passion in interiors for honouring the natural world. Furthermore, for every roll of wallpaper sold, 100m2 of critical wild habitat is preserved through World Land Trust. This is an eco-friendly fine gicleé digitally-printed “real” wallpaper. 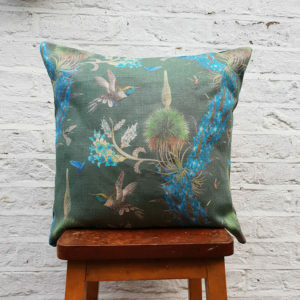 It is printed in the UK on a natural non-woven cellulose-based substrate made from recycled materials, recycled polyester (PET) fibre and recycled wood pulp. The production process is solvent free with minimal waste and energy inputs. The Andean spectacled bear, a mysterious and endangered species and inspiration for Paddington Bear, was the focus of my years of study in the Andean cloud forest of Bolivia's Madidi National Park. During long periods spent alone for my research, I became obsessed with the intricate patterns and colour around me. Lichens, thin-lipped frogs, hummingbirds and toucans, along with my bears, were the subjects of my detailed drawings, and have formed the basis of this design. The composition of the design itself was inspired by a Josef Frank design from 1938 called Anakreon. His design was based on a 3,500-year-old fresco, discovered by a friend of Frank's, from the palace in Knossos on Crete. Double-sided with a hidden zip. 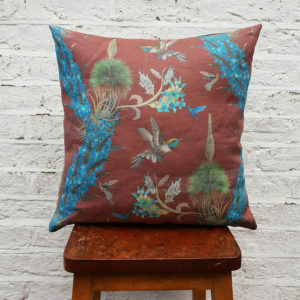 Madidi Hummingbirds tells the story of High Andean Hummingbirds and the strange family of Puya with its beautiful turquoise flowers. The Andean spectacled bear, a mysterious and endangered species and inspiration for Paddington Bear, was the focus of Dr Susy Paisley's years of study in the Andean cloud forest of Bolivia's Madidi National Park. During long periods spent alone for her research, she became obsessed with the intricate patterns and color around her. 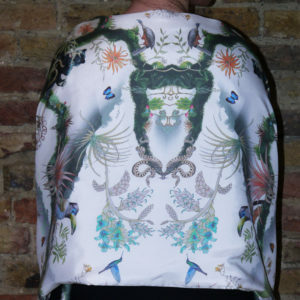 Lichens, thin-lipped frogs, hummingbirds and toucans, along with her bears, were the subjects of my detailed drawings, and have formed the basis of this design. The composition of the design itself was inspired by a Josef Frank design from 1938 called Anakreon. His design was based on a 3,500-year-old fresco, discovered by a friend of Frank's, from the palace in Knossos on Crete.